The King's Speech is a 2010 British historical drama film directed by Tom Hooper and written by David Seidler. 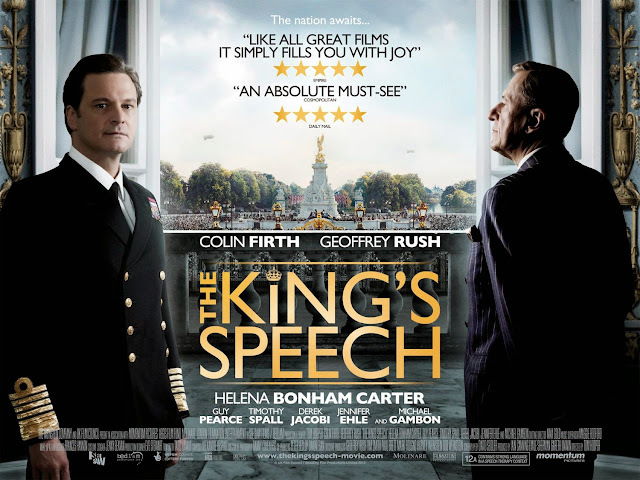 Colin Firth plays King George VI who, to cope with a stammer, sees Lionel Logue, an Australian speech and language therapist played by Geoffrey Rush. The men become friends as they work together, and after his brother abdicates the throne, the new King relies on Logue to help him make his first wartime radio broadcast on Britain's declaration of war on Germany in 1939. Principal photography took place in London and around Britain from November 2009 to January 2010. The opening scenes were filmed at Elland Road, Leeds and Odsal Stadium, Bradford, both locations standing in for the old Wembley Stadium. For indoor scenes, Lancaster House substituted for Buckingham Palace, and Ely Cathedral stood in for Westminster Abbey, while the weaving mill scene was filmed at the Queen Street Mill in Burnley. The cinematography differs from that of other historical dramas: hard light was used to give the story a greater resonance and wider than normal lenses were employed to recreate the King's feelings of constriction. A third technique Hooper employed was the off-centre framing of characters: in his first consultation with Logue, George VI is captured hunched on the side of a couch at the edge of the frame. Released in the United Kingdom on 7 January 2011, The King's Speech was a major box office and critical success. Censors initially gave it adult ratings due to profanity, though these were later revised downwards after criticism by the makers and distributors in the UK and some instances of swearing were muted in the US. On a budget of £8 million, it earned over $400 million internationally (£250 million). It was widely praised by film critics for its visual style, art direction, and acting. Other commentators discussed the film's representation of historical detail, especially the reversal of Winston Churchill's opposition to abdication. The film received many awards and nominations, particularly for Colin Firth's performance; his Golden Globe Award for Best Actor was the sole win at that ceremony from seven nominations. The King's Speech won seven British Academy Film Awards, including Best Picture, and Best Actor (Firth), Best Supporting Actor (Rush), and Best Supporting Actress (Helena Bonham Carter). The film also won four Academy Awards: Best Picture, Best Director (Hooper), Best Actor (Firth), and Best Original Screenplay (Seidler). Prince Albert, Duke of York, the second son of King George V, stammers through his speech closing the 1925 British Empire Exhibition at Wembley Stadium, while the resulting ordeal is being broadcast by radio worldwide. The Duke has given up hope of a cure, but his wife Elizabeth persuades him to see Lionel Logue, an Australian speech therapist in London. During their first session, Logue breaches royal etiquette by referring to the Prince as "Bertie", a name used only by his family. When the Duke decides Logue's methods and manner are unsuitable, Logue wagers a shilling that the Duke can recite Hamlet's "To be, or not to be" soliloquy without trouble while listening to "The Marriage of Figaro" on headphones. Logue records his performance on an acetate record. Convinced he has stammered throughout, Prince Albert leaves in anger, declaring his condition "hopeless" and dismissing Logue. Logue offers him the recording as a keepsake. After King George V makes his 1934 Christmas radio address, he explains to his son the importance of broadcasting to a modern monarchy. He declares that "David" (Edward, Prince of Wales), Albert's older brother and the heir to the throne, will bring ruin to himself, the family, and the country when he accedes to the throne- leaving continental Europe to the mercy of Nazi Germany and Communist Russia. King George demands that Albert train himself, starting with a reading of his father's speech. He makes an agonising attempt to do so. Later, the Duke plays Logue's recording and hears himself unhesitatingly reciting Shakespeare. He decides to return to Logue, where he and his wife both insist that Logue focus only on physical exercises, not therapy. Logue teaches his patient muscle relaxation and breath control techniques but continues to probe gently and persistently at the psychological roots of the stutter. The Duke eventually reveals some of the pressures of his childhood, and the two men start to become friends. In January 1936, George V dies, and David ascends the throne as King Edward VIII, but causes a constitutional crisis with his determination to marry Wallis Simpson, an American socialite divorcée who is still legally married to her second husband. At a party in Balmoral Castle, Albert points out that Edward, as head of the Church of England, cannot marry Mrs. Simpson, even if she receives her second divorce. Edward, in response, accuses his brother of trying to get revenge for the bullying the younger brother had suffered as a child. The older brother then reenacts his bullying habits, and Albert responds by stuttering uncontrollably. At his next session, Albert expresses his frustration that while his speech has improved when talking to most people, he still stammers when talking to his own brother, and reveals the extent of Edward VIII's folly with Mrs. Simpson. When Logue insists that Albert could be a good king instead of his brother, the latter labels such a suggestion as treason, and in his anger, mocks and dismisses Logue. When King Edward VIII abdicates to marry Mrs. Simpson, Albert accedes as King George VI. The new King and Queen visit Logue at his home to apologise, startling Mrs. Logue, who was unaware that the new king was her husband's patient. During preparations for his coronation in Westminster Abbey, George VI learns that Logue has no formal qualifications, as initially assumed by him. When confronted, Logue explains how he was asked to help shell-shocked Australian soldiers returning from the First World War. When George VI remains unconvinced of his fitness for the throne, Logue sits in King Edward's Chair and dismisses the underlying Stone of Scone as a trifle. Goaded by Logue's seeming disrespect, the King surprises himself with his own sudden burst of outraged eloquence. Upon the declaration of war with Nazi Germany in September 1939, George VI summons Logue to Buckingham Palace to prepare for his upcoming radio address to millions of listeners in Britain and the Empire. Knowing the challenge that lies before him, both Winston Churchill and Prime Minister Neville Chamberlain offer the King their support. The King and Logue are then left in the room. He delivers his speech somewhat competently, while Logue guides him. By the end of his speech, George VI is speaking freely with little to no guidance from Logue. Afterwards, the King and his family step onto the balcony of the palace, and are applauded by the thousands who have gathered. A title card explains that Logue was always present at King George VI's speeches during the war, and that they remained friends for the rest of their lives.